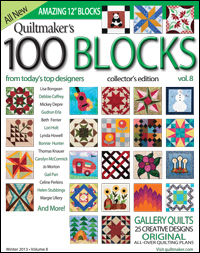 Thank you so much to everyone who entered the drawing to win a copy of Quiltmaker’s 100 Blocks, Volume 8! The lucky winner is #130, Nancy A. Congratulations!! The staff at Quiltmaker will be sending you your magazine. Enjoy! Many of you suggested putting apples or flowers in the basket. Absolutely! Go wherever your creativity leads you! If you didn’t win a copy of the magazine and you’re craving one, I have Volume 8 up on my website now, on the patterns page. I’d like to welcome new subscribers and those who’ve said they’ve bookmarked the site. Excellent! Be sure to take some time to poke around the blog. We celebrate all forms of appliqué here, and there’s tons of great information. Check out the appliqué bookstore, the categories, and the keyword search in the left sidebar. On the righthand side, you’ll find links to tons of designers and pattern companies. Whilst I was abroad, the staff at Quiltmaker put up a post on their blog Quilty Pleasures featuring my Basket of Oranges block, and my book Scrap-Appliqué Playground! Very cool! Go check it out on the November 18 post. And there’s an earlier post over there at Quilty Pleasures that I wanted to make sure you saw if you use Electric Quilt: Getting to Know My EQ Boutique. For years I’ve been encouraging my wonderful friend Cathy Perlmutter, author of The Uncommon Yarmulke, to think about blogging. She’s a quilter, she’s a writer, and she’s funnier than all get-out. At long last her new blog is up and running! It’s not all that often that we get to follow a blog from its infancy, so I urge you to go see GefilteQuilt: a mish-mosh. Start from the first post and catch up to the present. Cathy’s projects are wildly creative, vibrant, and (as you might tell from the title) eclectic. Her stories and generally the things that come out of her brains are humorous and easy to identify with. Hope you enjoy GefilteQuilt as much as I do. The lucky reader who came up the winner of Barbara Burnham’s Baltimore Garden Quilt is… Nellie! Congratulations to Nellie! And thank you so much to everyone who left warm and wonderful comments about Barbara’s work. I know she greatly appreciates it and so do I. New in the blogroll: Zebra Designs by Debra Gabel. Check out the totally charming Holiday Houses! Mark your calendars for the upcoming Book-A-Round 3, June 8-15! 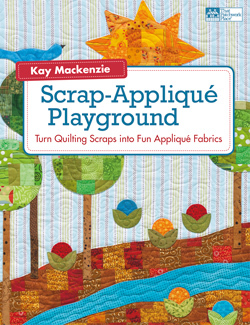 My new book Scrap-Appliqué Playground comes out in mid-April, and during the Book-A-Round in June we’ll zoom around the blogosphere visiting seven other fabulous quilting blogs who will each feature something fun about the book. This Thursday I’ll be headed to southern California once again for the 33rd Annual Glendale Quilt Show. The show, held at the Burbank Airport Marriott Convention Center, is Friday through Sunday, March 16-18. This is my first time as a vendor. I’ve attended the show before and had a fantastic time. In fact, once upon a time I received a Judges’ Choice ribbon for my Growing Hearts quilt and got to attend the awards banquet and everything :) So you might say I have a soft spot in my heart for the show. If you’re in SoCal I hope to see you there! Congratulations to Bev Adcock, my winner for the Fall Into Fall Quilt Bloggers Giveaway! Bev, I hope you enjoy all of the designs in Easy Appliqué Blocks: 50 Designs in 5 Sizes. Have done lots of applique in the past (distant past, lol!) It’s time to do that again. Come on down! There are a gazillion ways to appliqué and nobody says you have to do it a certain way. (If they do, think ‘noted and ignored’.) (That’s a quote from Psych :) ) Try out a few until you find the one that makes you comfortable and gives you results you like. Take the time to learn the tips and tricks, the little refinements that make a world of difference, before you throw up your hands in despair. I’ll be posting soon about the fabulous Keri Duke workshop I took last weekend and I’ll be talking about some of these issues then. This blog is the gateway to a ton of great appliqué information, many different kinds. Explore the blogroll of appliqué designers and pattern companies, and take a stroll through the Categories. Those subscribed by email, you’ll need to click over to the blog itself to see what I’m talking about. Thanks again for visiting during the Giveaway and I hope you all won prizes! You all left such nice comments on the Easy Appliqué Blocks virtual tour! The other bloggers, the publisher, and I greatly appreciate it! Your feedback is so valuable for all of us. Here are the readers who won copies for themselves through random draw from the comments. The readership was as widespread geographically as the tour itself. The power of the blog! There were scads more appliqué designers that I also saw and/or chatted with that were already on the lists. Other appliqué designers… if I’ve missed you, give me a shout!